What began last year at both Bailey’s Taproom and its sister bar, The Upper Lip, returns for a second installment. 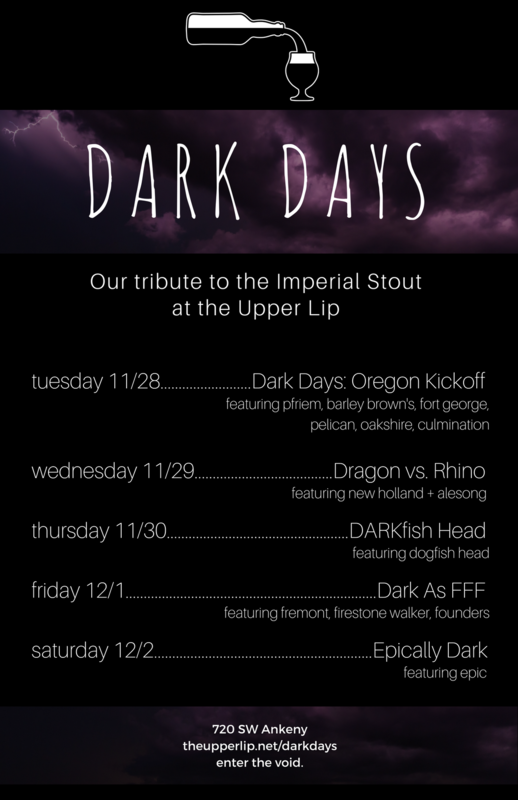 Dark Days will make its return from Tuesday, November 28th through Saturday, December 2nd at The Upper Lip. Taking place each day from 3:00-11:00pm, the 2nd Annual Dark Days will be a tribute to Imperial Stouts from near and afar. Look for some big, bold stouts from Barley Brown’s, Pelican, Fort George, Alesong, New Holland, Dogfish Head, pFriem, Oakshire, Fremont, Firestone Walker, Epic and more. This will also be the time when The Upper Lip will tap the coveted Founders CBS – Canadian Breakfast Stout. Best of all there is no cover to attend Dark Days! So when you’re downtown at the Holiday Ale Festival swing by The Upper Lip for some of the biggest, baddest, darkest beers available. Stay up to date on all of the happenings during Dark Days by following the Dark Days Facebook Event Page.